Outlook Actionable Messages cards are designed using the Adaptive Card format. The Adaptive Card format is a simple yet powerful declarative layout format that provides a lot of flexibility, allowing for visually rich cards. In this topic we'll cover the Outlook-specific features of the Adaptive Card format. The Adaptive Card format is only available for Actionable Messages sent via email. The MessageCard format is still supported but is now de-emphasized. Office 365 connectors and Microsoft Teams connectors do not currently support the Adaptive Card format. If you are implementing an Office 365 or Microsoft Teams connector, please refer to the MessageCard format reference. For information on which Outlook versions support the Adaptive Card format, see Outlook version requirements for actionable messages. Our Card Playground tool has been updated to support the Adaptive Card format. There you will find Adaptive Card samples (including the one below) that can help you get started crafting your own cards and also allows you to send those cards to your own Office 365 email account to see how they look in Outlook. The Adaptive Cards Designer provides a drag-and-drop experience to quickly build and tweak adaptive cards. 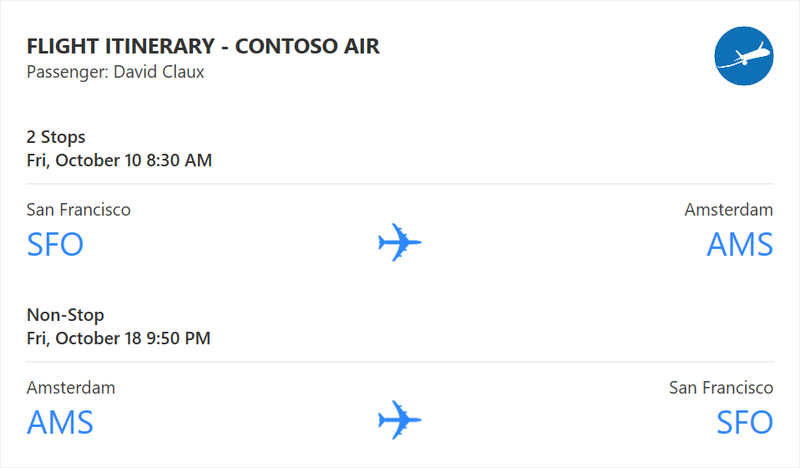 "text": "**FLIGHT ITINERARY - CONTOSO AIR**"
An Adaptive Card can be very simple or quite complex depending on the layout you wish to achieve. It is always a good idea to plan your design ahead of writing the Adaptive Card payload, using a paint tool for instance or even just pen and paper; this will make it a lot easier to translate visuals into the appropriate Adaptive Card constructs. Below are a few design tips to help you get started. All TextBlock elements in a card can be formatted using Markdown. Outlook supports basic Markdown. Since all TextBlock elements are processed as Markdown, be sure to escape Markdown special characters (such as * or #) if needed. Do use Markdown to format text. Don't use HTML markup in your cards. HTML is ignored and treated as plain text. Do design your Adaptive Card in such a way that it looks great on a narrow screen. Typically, a card designed for a narrow screen will scale well to a wide screen. The opposite is however not true. Don't design your Adaptive Card assuming that only users of Outlook on the desktop will see it. Not so long ago, most screens had a somewhat low resolution (1024x768 pixels for instance) and were operating at 96 DPI (Dots Per Inch), meaning that 96 pixels would fit within an actual inch of the screen. But in the past few years, screens have grown considerably in terms of resolution and DPI, especially on mobile devices, and it is now very common for a screen to operate at 192 DPI or even more. When designing your Adaptive Cards, you need to make sure your images will look good on any screen regardless of its DPI. Do design your images assuming they will be displayed on a high DPI screen. An image designed for a low (96) DPI screen will be blown up when displayed on a higher DPI screen and will therefore look pixelated. An image designed for a high DPI screen will be shrunk on a lower DPI screen which usually yields good results. In other words, it is better to design a 100x100 pixels image and display it at 50x50 pixels than to design a 50x50 pixels image and display it at 100x100 pixels. Do use the width and height properties of the Image element if you need to precisely control the actual size of the images in your card. Don't design your images with a fixed background color, like white, unless that background color is supposed to be visible to the user. In Outlook, your Adaptive Cards will not necessarily be displayed on top of a white background, and your images should be able to superimpose themselves on top of any background color. For that reason, do make the background of your images transparent. Don't craft your images with built-in paddings. Such paddings usually interfere with the overall layout by introducing undesirable spacing on the side of your image. Use the Container element only when necessary. The Container element makes it possible to group a set of elements together. Do use a Container to emphasize a group of elements: by setting the style property of the Container to emphasis you can make that Container, and the elements it contains, stand out. Do use a Container to associate an action with group of elements: by setting the selectAction property of a Container, the Container and its content become a single clickable area that triggers the specified action. Do use a Container to make a portion of your card collapsible: by using an Action.ToggleVisibility targeted to a Container, you can easily make a group of elements collapsible. Don't use Container for any other reason. Use ColumnSet only when you need to align several elements on a single horizontal line. Do use ColumnSet for table-like layouts in general. Do use ColumnSet if you need to, for example, display an image of the far left of the card and some text on the same line at the far right of the card. Use "width": "auto" for a Column to use as much width as is necessary to fit its content. Use "width": "stretch" for a Column to use the remaining width in the ColumnSet. When multiple Columns have "width": "stretch", they all equally share the remaining width. Use "width": <number> for a Column to use a proportion of the available width in the ColumnSet. If you have three columns with their width property set to 1, 4 and 5 respectively, they will end up using 10%, 40% and 50% of the available width, respectively. Use "width": "<number>px" to have a specific pixel width. This is particularly useful (and necessary) when creating table layouts. Don't use ColumnSet if all you need is stack elements vertically. Outlook introduces a set of additional Adaptive Card properties and features for use in the context of Actionable Messages. Outlook-specific Adaptive Card properties and features only work in the context of Actionable Messages. They will NOT work in other Adaptive Card enabled applications and are therefore not documented on the official Adaptive Cards site. The Action.Submit action type is NOT supported with Outlook Actionable Messages. If you include an Action.Submit in your card, it will not be displayed. The Input.Time element type is NOT supported with Outlook Actionable Messages. If you include an Input.Time element in your card, it will not be displayed. If you need to allow users to input a time, use an Input.Text instead and validate its value server-side. Outlook Actionable Messages use an HTTP-based action model via the Action.Http type. Action.Http makes it possible to make a GET or POST request to a specific target url as a result of a user taking an action in a card. type String Yes Must be set to Action.Http. title String No The title of the action as it will appear on screen on a button control, for instance. method String Yes Valid values are GET and POST. When method is set to POST the body property must be specified. url String Yes The url of the request's target endpoint. The url property supports input value substitution. Note: this URL must be accessible from the internet, you cannot use localhost. headers Array of HttpHeader objects No An optional list of headers that should be sent to the target endpoint . body String Only if method is set to POST The body of the POST request. The body property supports input value substitution. name String Yes The name of the HTTP header. For example, Content-Type. value String Yes The value of the HTTP header. For example, application/json. The value property supports input value substitution. Your service should return an HTTP 200 status code when it successfully executes an Action.Http action. If the action execution fails, your service should return an HTTP 4xx status code, and it should also include the CARD-ACTION-STATUS HTTP header in its response to specify a custom error message. The value of that header will be displayed to the end-user in case the Action.Http fails to execute. Follow these guidelines when returning a response to Action.Http actions. Do return the CARD-ACTION-STATUS header in your error responses. Do make the message in that header as informative and meaningful as possible. Don't mention either the name of the person taking the action nor the time the action is being taken in your CARD-ACTION-STATUS header. Once the request is approved or rejected, the card is refreshed to remove the approve/decline actions and update its content so it reflects the fact that it's been approved or declined. When an action is taken on a task, such as setting its due date, the card refreshes to include the updated due date in its facts. It no longer allows the user to respond. It shows updated status, like "Thanks for responding to this survey" alongside the user's actual response. Potentially include a new Action.OpenUrl action that allows the user to consult the survey online. Include the JSON payload of the new card in the body of the response to the HTTP POST request it received. Follow these guidelines when returning refresh cards. Do use refresh cards with actions that can only be taken a single time. In those cases, the refresh card would not include any action that cannot be taken anymore. Do use refresh cards with actions that change the state of the entity they are performed on. In those cases, the refresh card should include updated information about the entity, and MAY change the set of actions that can be performed. Don't use refresh cards to lead a conversation with the user. For instance, don't use refresh cards for a multi-step "wizard". Do include at least an Action.OpenUrl action to view the entity in the external app it comes from. The Action.InvokeAddInCommand action opens an Outlook add-in task pane. If the add-in is not installed, the user is prompted to install the add-in with a single click. When an Action.InvokeAddInCommand action is executed, Outlook first checks if the requested add-in is installed and turned on for the user. If it is not, the user is notified that the action requires the add-in, and is able to install and enable the add-in with a single click. Outlook opens the requested task pane, making any initialization context specified by the action available to the add-in. For more information, see Invoke an Outlook add-in from an actionable message. type String Yes Must be set to Action.InvokeAddInCommand. addInId String Yes Specifies the add-in ID of the required add-in. The add-in ID is found in the Id element in the add-in's manifest. desktopCommandId String Yes Specifies the ID of the add-in command button that opens the required task pane. The command button ID is found in the id attribute of the Control element that defines the button in the add-in's manifest. The specified Control element MUST be defined inside a MessageReadCommandSurface extension point, be of type Button, and the control's Action must be of type ShowTaskPane. initializationContext Object Yes Developers may specify any valid JSON object in this field. The value is serialized into a string and made available to the add-in when the action is executed. This allows the action to pass initialization data to the add-in. The Action.DisplayMessageForm action opens the read form of a message given that message's ID. Message IDs can be retrieved via the Outlook REST APIs. type String Yes Must be set to Action.DisplayMessageForm. itemId String Yes Specifies the ID of the message to open. The Action.DisplayAppointmentForm action opens the read form of a calendar item given that calendar item's ID. Calendar item IDs can be retrieved via the Outlook REST APIs. type String Yes Must be set to Action.DisplayAppointmentForm. itemId String Yes Specifies the ID of the calendar item to open. The Action.ToggleVisibility action makes it possible to show and/or hide specific elements of a card as a result of a user clicking on a button or other actionable element. Coupled with the isVisible property, Action.ToggleVisibility allows for an extra degree of interactivity within a single card. type String Yes Must be set to Action.ToggleVisibility. targetElements Array of String or TargetElement Yes The list of elements that should have their visibility toggled. When elements of the targetElements array are specified as strings, they must represent the Id of an element in the card; when the action is executed, these elements become visible if they were not, and invisible otherwise. When elements of the array are specified as TargetElement objects, the visibility of each targeted element is defined by the isVisible property of the TargetElement object. elementId String Yes The Id of the target element. isVisible Boolean Yes Specifies whether the target element should be visible once the action has completed. "text": "**Action.ToggleVisibility example**: click the button to show or hide a welcome message"
The Action.Transaction action has been deprecated. Payment request messages should be sent using the ActionRequest format instead. The Action.Transaction action triggers the payments in Outlook experience. When the user invokes the action, Outlook retrieves the latest invoice details from the merchant. This information is displayed in a pane in Outlook, allowing the user to click through the Microsoft Pay experience to pay the invoice. See Get started with payments in Outlook for more information. Before you can use the Action.Transaction type, you must register in the partner dashboard for payments in Outlook to receive a merchant ID and display ID. type String Yes Must be set to Action.Transaction. initializationContext Object Yes Contains required information for the payments in Outlook experience. initializationContext.merchantId GUID Yes Your merchant ID obtained by registering in the partner dashboard for payments in Outlook. initializationContext.displayId GUID Yes Your display ID obtained by registering in the partner dashboard for payments in Outlook. initializationContext.productContext Object Yes Developers may specify any valid JSON object in this field. The value is included in the payloads sent to your payment request and payment complete webhooks. "text": "$57.28 due on May 30, 2018"
Outlook Actionable Messages add support for the ActionSet element that makes it possible to add action buttons anywhere in a card. type String Yes Must be set to ActionSet. id String No The unique ID of the element. spacing String No Controls the amount of spacing between this element and the previous element. separator Boolean No Controls whether or not a separator line should be displayed between this element and the previous element. The separator line is displayed in the middle of the space defined by the spacing property. horizontalAlignment String No Controls the horizontal alignment of this element within its container. actions Array of Action objects No The actions to be displayed in the set. Aside from the fact that ActionSet can be placed anywhere in the card, it behaves exactly like the actions property of an AdaptiveCard. "text": "**Action.ToggleVisibility example**: click the button above to show or hide a welcome message"
isVisible Boolean No. Defaults to true. The initial visibility state of the element. When isVisible is set to false, the element is initially not visible in the card. It can be made visible using an Action.ToggleVisibility action, as documented above. Please refer to the previous example for an illustration of how to use isVisible. correlationId String No The correlationId property simplifies the process of locating logs for troubleshooting issues. We recommend that when sending an actionable card, your service should set and log a unique UUID in this property. When the user invokes an Action.Http action on the card, Office 365 sends the Card-Correlation-Id and Action-Request-Id headers in the POST request to your service. Card-Correlation-Id contains the same value as the correlationId property in the card. Action-Request-Id is a unique UUID generated by Office 365 to help locate specific action performed by a user. Your service should log both of these values when receiving action POST requests. expectedActors Array of String No expectedActors contains a list of expected email addresses of the users that may take Action.Http actions on the card. A user can have multiple email addresses and the Action.Http target endpoint might not be expecting the particular email address presented in the sub claim of the bearer token. For example, a user could have both the john.doe@contoso.com or john@contoso.com email address, but the Action.Http target endpoint expects to receive john@contoso.com in the sub claim of the bearer token. By setting the expectedActors property to ["john@contoso.com"], the sub claim will have the expected email address. originator String Yes For actionable email, MUST be set to the provider ID generated by the Actionable Email Developer Dashboard. hideOriginalBody Boolean No. Defaults to false. When set to true, causes the HTML body of the message to be hidden. This is very useful in scenarios where the card is a better or more useful representation of the content than the HTML body itself, which is especially true when the card contains actions. Consider hiding the original HTML body if the card itself contains all the information a user would need, or if the content of the card is redundant with the content of the body. Do always include a nice, meaningful HTML body, even if it is going to be hidden. The HTML body is the only thing an email client that doesn't support cards will be able to display. Furthermore, cards are not included when replying to or forwarding emails, only the HTML body. Don't hide the body when it is complementary to the information presented in the card. For example, the body of an expense report approval might describe the report in great details while the card just presents a quick summary along with approve/decline actions. width Number or String No (defaults to auto) This property allows for precise control of the width of a Column within its ColumnSet. See Column width values for details. verticalContentAlignment String. Valid values are top, center and bottom. No. Defaults to top. The verticalContentAlignment property makes it possible to vertically position the content of the column (e.g. all its elements.) This is particularly useful for table-like layouts. backgroundImage String No The backgroundImage property represents the URL to an image that is to be used as the background of the Column. The background image covers the entirety of the Column's surface and is scaled so as to preserve its original aspect ratio. If width is expressed as a number, it represents the relative weight of the Column within its ColumnSet. For a weighted Column to really be useful, there should be at least one more weighted Column in the set. For example, if column A has its width set to 1 and column B has its width set to 2, then column A will use a third of the available space in the set, while column B will use the remaining two-thirds. auto: The Column will use as much of the available space as is required to fit its content. stretch: The Column will use whatever space remains in the set. If multiple columns have their width property set to stretch, they all share the remaining space equally. <number>px (ex. 50px): The column will spread across the specified number of pixels. <number>*, (ex. 1*): This is equivalent to specifying width as a number. backgroundImage String No The backgroundImage property represents the URL to an image that is to be used as the background of the Container. The background image covers the entirety of the Container's surface and is scaled so as to preserve its original aspect ratio. These properties behave exactly like their counterpart on the Column type. Please refer to the above example. width String No This property allows for precise control over the width of an image, in pixels. The allowed format is <number>px where <number> is an integer. When width is specified, the size property is ignored. If width is specified but height isn't, the height of the image is automatically computed so as to respect its aspect ratio. height String No This property allows for precise control over the height of an image, in pixels. The allowed format is <number>px where <number> is an integer. When height is specified, the size property is ignored. If height is specified but width isn't, the width of the image is automatically computed so as to respect its aspect ratio. backgroundColor String No The backgroundColor property specifies the color the image should be rendered on top of. backgroundColor is particularly useful in cases where a single image should be used on top of a variety of background colors, as it removes the need to craft multiple versions of a single image. The format of the backgroundColor property is #RRGGBB where RR, GG and BB are the hexadecimal values of the red, green and blue components of the color, respectively. "text": "Below, the same image is presented on top of two different background colors."